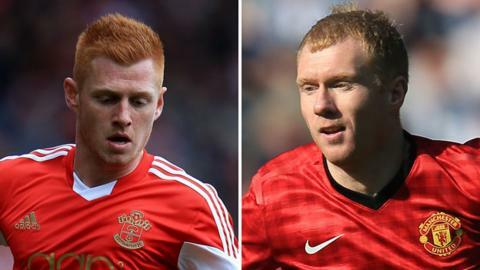 Southampton midfielder Harrison Reed says he is flattered to be compared to Manchester United legend Paul Scholes but believes it is more due to the colour of his hair than anything else. Reed has made his breakthrough into Southampton's first-team this season. "It's a massive compliment to be compared to him and mentioned in the same sentence," Reed, 19, told BBC Radio Solent. "I think it's more to do with the colour of my hair." Reed is also an England Under-19 international and another recruit from the club's famed academy. The midfielder was a part of the same scholarship group as James Ward-Prowse, Luke Shaw, and Calum Chambers. He has made three Premier League appearances for the club this season and describes himself as a "tenacious, ball-playing midfielder who likes to get on the ball and pick a pass". His style of play has led to Saints Under-21 coach Martin Hunter and football director Les Reed draw comparisons with Scholes - who made nearly 500 appearances for United, scoring over 100 goals. "I agree the way I play is like him sometimes," Reed said. Reed, who made his Premier League debut against Manchester City in December, is also similar in stature to Scholes. But he says coming up against the physical presence of players such as City midfielder Yaya Toure does not intimidate him. "I just play my game," he said. "It's got me to where I am now and I think their advantages are my disadvantages and my advantages are their disadvantages and that's the way I play." Reed hopes to make his full Premier League debut against Swansea at the weekend, something he says will be a "dream" and added Saints still have something to play for this season despite a European place being unobtainable. "One more point will get us that record Premier League total for a Southampton team and we are going there to spoil the party," he said.